The proximity principle suggests we form our strongest relationships with people close to us. This is fairly intuitive. Most of us would point to the people close to us – family, friends, neighbours, colleagues – as the strongest relationships in our lives. These relationships can be very influential. The way we think and act is strongly influenced by the people close to us. Our behaviour is, to a certain extent, dictated by the people around us. Why is this relevant to a fundraising organization? Fundraising organizations can leverage the proximity principle by looking at the people close to their donors. A major gift donor’s family, friends, neighbours and colleagues are influenced by the major gift donor and vice versa. They are close to each to other and they have formed strong, influential relationships. How can we find people in close proximity to our donors? In Canada, many major gift donors give both time and money to charities. They sit on charity boards and, in many cases, corporate boards. Realizing these connections is a powerful fundraising tool. Look at the boards your major gift donors sit on and then look at the other people on those boards. They have a relationship with your major gift donor and are likely influenced by your major gift donor. There is a good chance these people can become your next major donor. 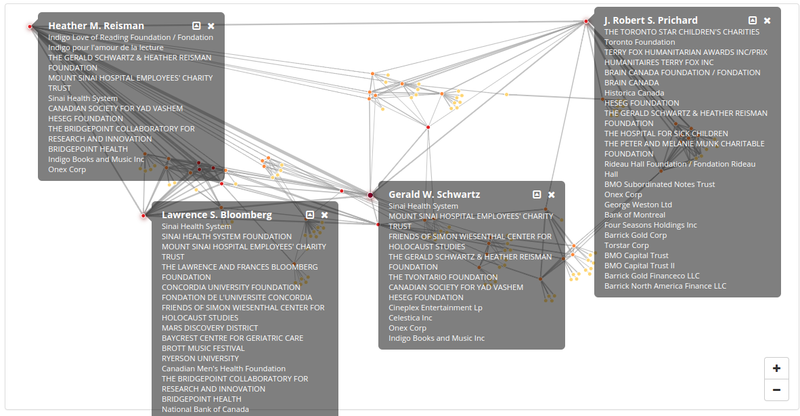 Let’s take a look at some of the board connections of one of Canada’s most generous philanthropists, Gerald Schwartz. Note: this list includes historical and current board memberships. Judging by these positions, Gerald Schwartz is connected to a number of people who will be of interest to a fundraising organization. Mapping these relationships will allow us to see who Mr. Schwartz is in closest “proximity” to and allow us to see if those connections are worth looking into further. I generated this map using CharityCAN’s relationship map function and CRA and Corporate Canada data. Alternatively, this could be done by pulling CRA data and relevant management proxy circulars and manually creating a relationship map. As we can see from this relationship map, there are a number of people in proximity to Gerald Schwartz who are plausible major gift prospects. This example illustrates how fruitful understanding who is in proximity to your major donors, board members, or any other friend of your organization can be. Another way fundraisers can use proximity to find new prospects is by examining who lives close to their major donors. Postal code analysis is the easiest way to do this. Simply cross reference a new prospect’s postal code against your donor database and see if your prospect lives in the same neighbourhood as any of your major donors. This can be a valuable indicator of proximity influence as well a useful conversation starter. CharityCAN’s postal code lookup tool can do this quickly, as well as show you important wealth indicators such as average dwelling value, discretionary income, and donations for that postal code. In the example below, I did a lookup on the postal code of a fictional major donor. In addition to the wealth indicators, this search shows me three other potential donors who live in the same neighbourhood as my major donor. The above examples make a strong case that proximity research is prospect research time well spent. 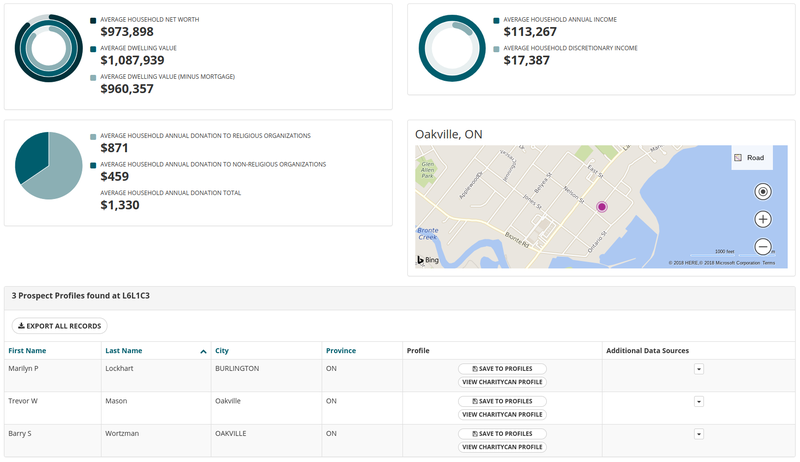 Looking at who is in proximity to our major gift donors can quickly generate a list of prospects worthy of further research. Finding out who your donors colleagues and neighbours are can be the first step to finding your next major gift donor.